Kids are playing games together. Leading kids through orienteering games improves their navigational skills, builds teamwork and the ability to communicate and gets them physical exercise. Most orienteering games utilize a course, which you’ll need to set out ahead of time, and the kids compete using a map to navigate their way through the course as fast as they can. The string course game is appropriate for young kids, who are just starting to learn navigation skills. Use a large field, park or room for a course. String colored ribbon or yarn over the course and set out some discrete items to act as markers at various places along the string. Give the kids a map that features the layout of the stringed course as well as circles to designate where the markers are located. As the kids move along the string course, they have to use the map to help them locate the markers. Make the game more challenging by leaving the markers off the map and have the kids write their own circles on the map when they come across them on the course. The orienteering relay race can be modified to accommodate kids of different ages and abilities. It improves agility, balance and coordination, and develops the ability to read a map. Split the kids into small teams, such as three to four to a team. Each team starts behind the same line. One child from each team picks up a map to begin and then uses that map to negotiate her way through a course. The course can feature different obstacles along the way, such as a line of cones through which the kids must zigzag, hurdles they need to jump over, beanbags they need to throw into a bucket. Once this first child gets to the end, she deposits her map in a box and sprints back to tag her teammate, who then picks up a map and takes his turn through the course. The partner direction game improves kids’ understanding of the directions north, south, east and west; helps them learn to read a compass; and improves communication skills. Assign each kid a partner. One partner is given a list of directions while the other is given a compass. The directions, different for each pair, lead to a particular hidden object, which you have previously set out. The child with the map must stand behind a line and give his respective partner the list of directions. For example, the directions could include to walk two steps north, then jump three times to the west and so on. The partner with the compass must hear each direction and then use the compass to perform each step. Once the directions lead the second child to the respective hidden object, she picks it up and runs back to her partner. Older kids, like those of middle and high school age, will enjoy sharpening their orienteering skills with a scavenger hunt. This game will teach them how to use a compass. 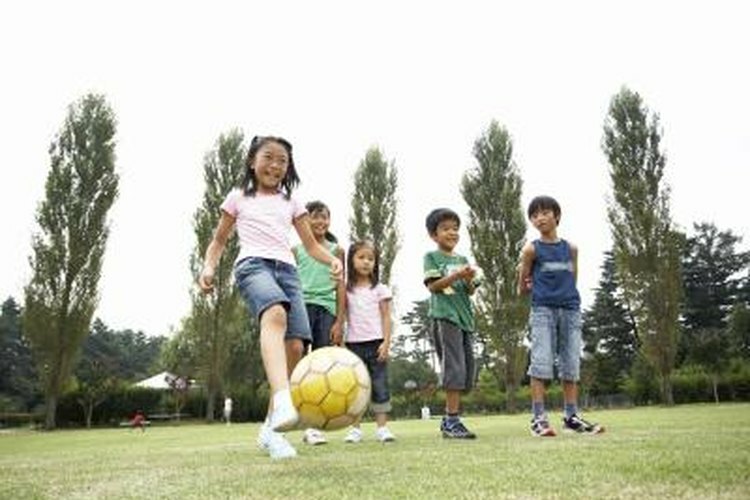 Separate the kids into teams of two to four, with each team having their own compass. In a large field, wooded area or room, spread out items for the teams to find. Give each team a set of instructions on how to find each hidden item. For example, to find the first item, you can tell them to go 300 degrees for eight steps, then 60 degrees for eight steps and, finally, 180 degrees for eight steps. Teams must write what item they find there and then move onto the next set of directions, which will take them to the next hidden item.